There’s a new craze in town. It’s name is Inis. It’s a Euro-Ameritrash Hybrid that pits players against one another in a Celtic setting. The game draws inspiration if not game mechanics per se from Blood Rage and Cyclades. The game has been a good fit for our group too. Indeed, everyone has loved it so far. Except me. I’ll try to rectify this before our next installment of Hits & Flops. The Muskegon Area Gamers are moving from Ameritrash games into Wargames. Here I Stand and Sword of Rome have been huge hits. All of us love those games. That makes GMT’s Cuba Libre a no-brainer. Cuba Libre allows up to four players to take on the major forces that fought for supremacy in the age of Castro and Che. This card driven game has all the important figures from this time period: Castro, Frank Sinatra, Meyer Lansky. This game is a sequel to another game, Andean Abyss. If Cuba Libre is the hit I suspect it will be, look for Andean Abyss to be added to the library. Last month I wrote an election day blog. I mentioned Numbskull Games’ Divided Republic. Given our love of 1960: the Making of the President (and we do love that game, don’t we, Brandi?! ), I predict Divided Republic will be a hit. The game shares much with 1960 but allows four players to play. And the time frame is shifted from the tumultuous 1960’s to the upheaval of 1860. So many rules to read! I’ll have to pawn off this game on someone else so we can play it soon. Lyssan is Euro-wargame hybrid. It’s a wargame but there’s so much abstraction it could be called a Euro. There are several different pieces at each player’s command. Knights hold territory and fight masterfully. Nobles hold territory, support priests, and fight poorly. Castles hold territory, spawn new units, and protect knights and nobles. Priests manipulate influence and support spies. Spies assassinate priests and other spies, and have the devastating power to steal other players’ court cards. The game play sounded interesting to me. I probably wouldn’t have traded for it, except I found a $2 copy of Escape: the Curse of the Temple that someone wanted in exchange for Lyssan. For $2 plus shipping, I get Lyssan? Sold! Sherlock Holmes, Consulting Detective has been an unexpected hit. I thought the amount of in-game reading would be a put off. I was wrong. Then Brian brought over the Cthulhu version, Mythos Tales. That game was such a hit, that it rousted Kevin from his slumber at Prof. Mike’s house. Taking these cues, I picked up Watson & Holmes: From the Diaries of 221B. There are several cases for players to solve. Players work independently to be the first to solve it. I’m looking forward to cracking these cases. Maybe after SeaFall is over. I like Eminent Domain. But it fell out of my good graces a couple of years ago. I’ve reflected on my decision to trade it away. Now that the newest expansion, Exotica, is available, I really took a hard look at Eminent Domain again. Eminent Domain is a deck builder, akin to Dominion. But Eminent Domain does not have the huge set of cards Dominion has. By design. You build your deck with a very small cache of cards. This would be a strike against Eminent Domain. But Eminent Domain lifts one of the most interesting mechanics from Glory to Rome: to follow or dissent (in Glory to Rome, it’s called “follow or think”, but mechanically identical). The fact that you have an impact and make decisions when it’s not your turn, makes Eminent Domain a better fit for me than Dominion. The space theme helps too. But the two expansions (Escalation and now Exotica) really take Eminent Domain to a new level. I’m looking forward to getting our Thursday night group up to speed on this game. I’m a fan of Mac Gerdts’ designs. He came up with the famous Imperial roundel. He’s used it in several of his games, reapplying it to several different themes. Antike was a pretty good find. I’m looking forward to our group giving it the same treatment as Imperial 2030. And not the treatment we gave Navegador. We played Navegador once and relegated it to the dung heap. I think our tastes have changed enough to necessitate reacquiring Gerdts’ classic (and out of print) game of exploration and and colonization. And my copy just showed up in the mail today! I mentioned earlier what a huge hit Here I Stand has been. Virgin Queen is the sequel in every sense of the word. It takes place in the immediate aftermath of the Protestant uprising seen in Here I Stand. Plus its rules are 70% identical to Here I Stand. I picked up a copy a couple of years ago. Then we stopped playing wargames altogether. When someone in Seattle offered me a mint copy of Ogre the Designer’s Edition (a 35lb box) in exchange, I couldn’t refuse. Kevin hasn’t let me live it down because he wants to try Virgin Queen so badly. And Debbie hasn’t let me live it down because the 35lb box was delivered to the breeze way and proved difficult to move. She also refused to believe me that Ogre the Designer’s Edition had been left in our house by the previous owner. But I redeemed myself, at least in Kevin’s eyes. I found an uber cheap copy on eBay. I believe Kevin’s exact response was, “You da man, Santa”. I’m confident enough in my masculinity to take that compliment. Out of the Box Games always has amazing Black Friday sales. And I always make a point of braving the cold to buy games that I largely could live without. I recognized several of the people in line this year: Rocky, Jeremy Scott Pyne and Steve. We fell upon Out of the Box like a plague of locusts, consuming all the cardboard in our path. I had been eyeing the two player stand-alone Eminent Domain knock-of Battlecruisers. I just couldn’t pull the trigger. Then Black Friday rolled around with its 70% off sticker. Suddenly the trigger was pulling itself. Part of my return to Eminent Domain is the designer’s continued support for this universe. Seth Jaffee has even mentioned he was going to readjust the theme of Terra Prime so it was in the Eminent Domain universe. (Long time readers of this blog may recall my glowing endorsement of Jaffee’s Terra Prime.) And picking up a cheap copy of Battlecruisers also endears his universe to me. We Come in Peace is a dice version of the classic arcade game “Space Invaders”. Such a game would generally interest me, but a good filler is hard to find. And Out of the Box made it hard to resist with a whopping 80% off sticker. I think I paid less than $5 for it. Jeff was practically giving it to me. Target had a Black Friday sale too. Target has been making a play for the board gamer dollars. They carry a lot of high end games now. And they have been getting some exclusive games, most notably the recent Oregon Trail board game. IDW and Target worked out a deal for a standalone Machi Koro game called Bright Lights, Big City. For 50%, I pulled the trigger. I also found Suspicion for 50% off at Target. This was also a Target exclusive. I’ll let you take a look at the 46 second trailer. It’s cute. It’s been several months since I last mentioned my Quest for the Grails. I finally added a key piece in that mosaic: a complete and functional copy of Milton Bradley’s Dark Tower. The box has “$20” written in Sharpie on it. I might have to replace the box. But the tower and game is good. A Goodwill in Maine came across a copy and listed it on eBay. And I couldn’t resist. Orson Welles was so compelling in his 30 second TV spot. Parker Brothers dabbled briefly in Euro games. I know, it’s bizarre. No one in the Muskegon Area Gamers believed it existed until I added it to our shelves. Designed by Klaus Teuber of Setters of Catan fame, Der Fliegende Hollander (the Flying Dutchman) is a luck mitigation and negotiation game. This game has been on my radar for a while. It’s a Grail to me because it’s hard to find in the States–despite being pedestrian in Europe. After my election day post, I was enamored by the games I discussed. I looked high and low for copies of GDW’s Campaign Trail and 3M’s Mr. President. I settled on buying them on eBay. There were several games that met the criteria of that election day blog post but Campaign Trail and Mr. President are special. I think our group, which has been very receptive to classic games, will greet these games with open arms. Despite our brief hiatus, the Muskegon Area Gamers still have a strong pulse. Let’s get back to basics: new game acquisitions! I’ve added several games to The Gaming Annex’s library. But some of the other members have also added some notable games too. Here’s a peek at what will undoubtedly be hitting the table soon. Prolific game designer Vlaada Chvátil decided to remake my favorite minis game into a board game. The outcome was 2011’s Mage Knight the board game. It is immensely popular, currently rated as #11 all time on board game geek. I didn’t particularly care for the game. It was tightly designed but was brutal in its resource management. I could see its appeal to heavy gamers but it didn’t click with me. Then I heard that WizKid’s was going to reimplement Mage Knight with a Star Trek theme. I was intrigued but entirely sold on it. A retheme wouldn’t address my concerns. Still, the game weighed on my mind. I heard the reimplementation included some updates to the game. Some of the minor criticisms of Mage Knight would be tweaked in Frontiers. The weight on my mind became unbearable. I ran (okay, I drove) to Out of the Box and bought a copy. I’m going to try to get the rules digested soon. This will be a Sunday afternoon game for sure. Look for our superficial judgement in an upcoming edition of Hits & Flops. Castle Panic is a cooperative game. Players work together to stop the onslaught of rushing orcs and goblins from destroying a castle. I saw that Fireside Games rethemed their popular family game Castle Panic with a Star Trek theme. Instead of defending a castle against hordes of orcs, you must now defend the Enterprise against hoards of Klingons. The castle walls have been replaced with deflector shields. The castle has been replaced by a 3-D replica of the Enterprise. But the rules changes are what are really interesting. The simple game end mechanic of surviving the onslaught has been replaced. There are different missions you go on. And you win when you complete this mission. This means there are new mechanics. Color interested. And Castle Panic is a game my wife plays with on occasion (hi Debbie!) So this should add some spice to those sessions. The Muskegon Area Gamers have been fans of Avalon Hill’s Civilization series since the early 90’s. Back before we were even known by that moniker. Advanced Civilization was an amazing expansion. Time passed and the Cult of the New took over, relinquishing Civilization to the back of the shelf. Twice last year we blew the dust of this game, now hoary with age. Matt had been bugging me for some time about putting the game back on the schedule for 2016. We took it out for a spin on Sunday. Nine of the toughest gamers showed up for a 14 hour session. Look for a full review soon. But I will say I was a fan of many of the changes. The new advancements add much to the game and fix some definite problems with the original design. I’ve loved mystery games since Santa brought me a copy of Clue in 1981. The hunt for good mystery games continues. They are so hard to find. I came across 27th Passenger: A Hunt on Rails when I was perusing board game geek instead of working. My interest was definitely piqued. Players are given a secret role. They then try to figure out which of the other 27 possibilities their opponents are. Passengers (NPC’s) come aboard the train at different intervals of the game. These passengers are the untaken roles. Players play action cards to deduce their opponent’s roles, to deduce the passengers’ roles or to misdirect their opponents. The game has a solid 7.0 rating and a 45 minute play time. Both seem perfect fits for the library. I found a person on BGG who wanted to trade it to me. I jumped at the chance. I can’t wait to bring this to the table. I picked up Escape from the Aliens from Outer Space because the premise seemed so cool. Everyone is dealt a secret role: alien or human. Everyone moves in secret. The humans try to move to an exit. The aliens try to kill the humans before this happens. Players have their own dry erase boards to record their movement. Players draw a card that tells them if they must announce their current location or if they can bluff about their current location. The rules are simple but the game sounds intriguing. We gave it a spin a couple of weeks ago. The game seemed like it would be very good with advanced rules. The game has a flaw when playing with the basic rules. I’ll give the advanced rules a try before the next Hits & Flops post. I’ve seen [redacted] by Ludicreations sitting on the shelves at Out of the Box for a couple of years now. I let the 6.4 game rating dissuade me from purchasing. Sure, the premise of hidden teams trying to win an asymmetrical game was usually an auto-buy for me. But the reactions on board game geek were loud and consistent. I decided to look into the game a bit deeper. It seems the publisher rubbed people the wrong way. The publisher was flippant about some of their kickstarter practices. Board game geek users are getting tired of kickstarter games (with good reason). And a flippant publisher will get his games bashed. I decided the criticism was directed towards the publisher and not the game. The game seems like a strong team game–something our library could use more of. I’ll probably give the rules to Dusty and have him read them. With any luck, we will play this week! Speaking of kickstarter games, we have one of the most anticipated games of 2016 here: Scythe. Scythe is an alternate history of the 1920’s. Mechs walk around Eastern Europe. People scurry for resources. And the various factions vie for power. The game comes with a massive amount of bits. They must have harvested the forests of Eastern Europe to make their kickstarter pledges. There’s lots of plastic and wood pieces (which strikes me as odd). Two members of our group have copies. I think we will be breaking this out on a Sunday when Nick Sima has some free time to teach it to me and Kevin. I think this could be a big hit with our group. I expect Nick Sima will be writing a post about it after we’ve given it a whirl. It’s been a while since I’ve done a piece about our most recent game acquisitions. I’ve completed a few trades to acquire some of the games below. I also cashed in some Speedway reward points for eBay gift cards to buy some of them. Let’s take a look at The Gaming Annex’s latest offerings. We played the game once many years ago. The game didn’t go over very well with Jon. He hated the game so much he used the game as a Christmas tree prop until he traded it. Eagle Games kickstarted a deluxe edition of the game. The deluxe edition has phenomenal components. But they also overhauled the rules. I think the new edition is going to give Clash of Cultures a run for its money as our standby civ builder. Empires: Age of Discovery is largely a worker-placement game. It’s also largely an area control game. Ugh! Worker-placement with area control?! That’s been done a billion times! I know, I know. But Empires has a different take on worker-placement. There are different workers. Depending on which worker you send, you get a different benefit. Send a soldier to New Granada and you will be able to pick off your opponent’s units. Send a missionary and he converts a local, granting you an additional worker. Send a merchant and get a cool cache of, well, cash. Because of warfare, there is a constant flux in the area control aspect of the game. This makes every decision super important. It also keeps players engaged while their opponents are taking actions. This is what will ultimately set Empires apart from other worker-placement games. There are some designers that come up with clever mechanics. Rüdiger Dorn is one of them. Genoa, Istanbul and Jambo are all examples of his handiwork. Any discussion about the greatest game designers will invariably give a nod to Dorn. And then there are some publishers that make really good games. HABA makes children’s games, albeit very good games for children. When I saw HABA had decided to enter the family game market I was intrigued. When they announced their intent to publish a Rüdiger Dorn game it was a foregone conclusion that I would own a copy. Karuba has the puzzle aspect of Genoa. You will place tiles onto your player board to complete routes from one end to the other. But Karuba is a family game so the heavy min/max aspect is removed. Karuba is a multi-player solitaire game where players strive to complete their own player board first. The reviews for Karuba are glowing. The game will be in the Top 100 for family games on BGG. It may even make it to the Top 10–the game is that well liked. I’m really looking forward to getting this to the table with some lighter gamers to see if it’s a huge hit. have been pumping out pirate themed games like crazy. It’s now one of the more common themes around. the game had potential. But I also thought it had a hefty price tag: over $100 for used copies (it was out of print). The good people at IDW Games got the rights to reprint Fire and Axe. I was able to trade for a used copy of the reprint recently. Now I have to get Nick Sima to read the rules so he can reteach me the game. In Fire and Axe, players get seven actions on their turn. They can load goods onto their longboat, set sail, raid or trade. You will complete objectives like “Raid Dublin” so you can score points. You will draw rune cards to help you move and raid more effectively. This sounds like a perfect viking game. And it sounds like it’ll be a good fit for the group if we give it a chance. I have the feeling that in an upcoming “Hits & Flops” entry that Fire and Axe: a Viking Saga will get a high mark. Speaking of pirate themed games, I picked up Sea of Clouds. Sea of Clouds will not replace Merchants & Marauders. But it could fill an important niche in my library: a lighter game to wrap up the evening. Sea of Clouds takes one of the core mechanics of Cleopatra: Society of Architects and makes it into its own game. There are three cards drawn and placed face down. You may look at one of the cards. If you want it, you add the card to your hand. If you don’t, you add an additional card to the pile. Then you may take a different card pile. The cards have different colored backs that allow you some information as to what you might be picking. The cards do different things like score points, sets to be collected or pirates with cool actions on them. Sea of Clouds will not be the main course of a game night. But there are times when we get done with a big game and need something lighter. I think Sea of Clouds will fit into this category. I’ll bring it to CabinCon. I’ll post about it in an upcoming Hits & Flops post. With this much going for it, how could I not pick it up? In Adventure Land, players move their 10 pawns on a 10×10 grid. Pawns move like rooks in chess. However, they can only move right or down. So you have to be clever in your movement in order to get the goodies that spring up on the board. Swords, monsters, herbs and gold all appear on the board. Players score points for collecting gold and killing monsters. Players use swords and herbs to kill the monsters. Swords give you dice and herbs are added to the dice value after you see the roll. I think Adventure Land, much like Karuba, will fill a niche in The Gaming Annex’s library. This niche would be “the primer”–a game you start the night off with. It whets your appetite for the meatier games. After you play a primer you are really raring to feast on the main course. I’ll bring Adventure Land to CabinCon as well. I’ll let you know how it goes over. Out of the Box Games has started their membership drive for 2016. If you buy $150 during their membership drives, they waive the membership fees for a year. This allows you to enjoy the discounts all year long for free. I grabbed some games I think will be good fits for our ever-changing group. The elusive dungeon crawl. They are hard to find in board game form. And good ones are almost non-existent. To solve this problem I bought Dungeonquest. In Dungeonquest, you can be eliminated from the game. On the first turn. It’s a merciless. Dungeonquest is an old Games Workshop game that FFG has reimplemented. The combat system has been overhauled so it’s more streamlined. The components were given a facelift. Up to four intrepid adventurers can brave the labyrinth to loot the dragon’s treasure. Kingsburg is a fan favorite at The Gaming Annex. It’s simple enough to teach to newbies and it’s fun enough to play on occasion for the experienced player. Alien Frontiers is the mean girls version of Kingsburg. You roll your dice. You place them onto the mining world, the colony world or the solar panels. You harvest resources to build colonies. But you can steal your opponents’ resources, take control of valuable fields on the colony world or steal his action cards. Yes, action cards. This is the biggest difference between Alien Frontiers and Kingsburg. The game’s depth comes from the different cards you will have in the game. Alien Frontiers was one of the first really successful kickstarter games. It was certainly the inspiration for Kingsport Festival, a game very similar mechanically to Alien Frontiers if not thematically similar. I think Alien Frontiers will be a good alternative to Kingsburg. Kingsburg has been a solid game in my library. But Alien Frontiers will be a good surrogate when we want a different feel. I’ve had my eye on Shadow Throne for a while now. With the membership drive in force, I decided to pull the trigger. The game box is not all that much to look at. The characters are sketched with an uninteresting drab color palette. But the game supports a decent rating of 6.8 on BGG. In Shadow Throne, there are three factions vying for control. But players do not control a faction. They play cards from any faction in order to gain either VP, money or to use a special power. Each is important and timing is critical. The game has a drafting mechanic whereby you take a card and pass the rest to the next player. This mechanic usually goes over well with our group. Then you play a card. Because timing is critical, you may end up not playing a card you drafted. This idea sounds very intriguing to me. I’m hoping Shadow Throne is a meatier game than 7 Wonders. We will have to get this game on the docket soon. Raptor is a two player game where one player takes on the role of a group of scientists who are trying to capture some raptor cubs. And the other player plays the mama raptor who must protect her offspring. Raptor is an asymmetrical action point game from the two Brunos: Cathala and Faidutti. This is the same team that brought us Mission: Red Planet. Players have nine action cards, each numbered from 1 to 9. Each card also has a special ability. Players simultaneously reveal a card. The player who played the lower value gets to do the special ability. The other player gets action points equal to the difference in the card numbers. The goal for the raptor is to kill all the scientists or to get three babies to escape. The scientists must capture three babies or kill the mother. What I find intriguing about this game is: the theme (I love Jurassic Park), it’s asymmetrical and it plays in 30 minutes. Look for this game to get played often! I like push your luck games. And I like games which allow you to mitigate randomness. I’m probably not alone in either of these preferences. That would explain the new hit from Gamewright: Dragonwood. You roll one die for each card you play. For example, if you played a two card straight, you would roll two dice. If your dice roll is high enough, you kill the monster card! Otherwise you get your hand of cards back. Gamewright is like the designer game version of Parker Brothers. Their game catalog includes Forbidden Desert and Forbidden Island. They have decent components and pretty good artwork. They usually wrap all this up in a family style game (hence my remark about Parker Brothers). I don’t have any Gamewright games that hit the table with any frequency. We will see if Dragonwood will break that streak. It’s been over a year since I’ve played Kemet. How do I know? Because Nick Sima has been pulling the game off my shelf for the past year saying, “We should play this”. Kemet is a good game. But since I’ve played Forbidden Stars, I haven’t had the need to play Kemet. But the expansion may change that. The expansion adds a fourth pyramid color: black. At game start up, players decide which three colors they will use. If you want to use a fourth color pyramid, well then take one over from your opponents. The expansion includes new monsters and new action cards. But what excites me is the new priest track. Players may move a priest onto a separate game board. If your priest progresses far enough, he gets special powers or victory points. I’m looking forward to getting Kemet to the table. I may have to tap Nick Sima to read the rules as I may have forgotten some of them. Christmas 2015 has come and gone. This Christmas season brought me several new games to add to The Gaming Annex’s library. I missed a Tuesday game night last month because my work sent me to Minnesota. It seems Kevin and Jon took upon themselves to learn Star Wars Armada on that Tuesday. It also seems that they both liked the game but were not impressed with the ship assortment in the base game. I felt the same. I’ve decided that I would deliberately tweak my Armada collection rather than be a completest. This has the noted disadvantaged not being able to acquire all the different power cards. But it has the noted advantages of having a fleet of ships that were in actually in the movie while also being lenient on my wallet. I’ve been waiting for Fantasy Flight to release the Imperial Class Star Destroyer. with the Rogues and Villains expansion. I’ll probably keep the Millennium Falcon and Slave I (since they are canon). I’ve been looking for a viable mining game. One of my grail games is King Oil, the old Milton Bradley Game. King Oil pits players against one another in the Texas oil fields. I’ve rolled out Black Gold to the Muskegon Area Gamers a few years ago. After several goes, Black Gold was just not a hit. When I heard Tory Niemann had designed Pay Dirt, I was intrigued. Niemann, you might remember, designed Alien Frontiers, the Kingsburg-like game with more bells and whistles. In Pay Dirt, players auction off mining claims, purchase mining equipment, hire workers all in the attempt to acquire the most gold pieces. Equipment will breakdown, requiring maintenance. New workers will be available for hire. And each round, a set of hardships will befall the players. Whoever more efficiently manages their mining operation will be the winner. I’ll try out Pay Dirt in the foreseeable future. I’m optimistic that this will be THE mining game I’ve been looking for. Flip City was an impulse purchase. I’ve never found a strong city building game. Not one that I’ve liked anyway. I thought a little game like Flip City couldn’t be worse than Sunrise City. Flip City is a deck building game. Normally, I could take or leave deck builders. But Flip City has a twist. And it’s not just a novelty either. In Flip City, the cards are double sided. You can upgrade your cards to the obverse side along the way. In Flip City, you will not have a hand of cards. You will draw cards from the top off the deck, pressing your luck until you bust or until you stop. If you press your luck too much, drawing too many frowny faces, you lose your turn. Otherwise, you can make purchases or upgrade your cards. If you manage to play 18 cards on your turn or if you play cards with a total of eight victory points, you win. This game will probably work okay for a two player game. I doubt I would “push my luck” and play it with three players due to down time. Santa brought me Telepathy this year. Telepathy is a code breaker for two players. The game board is 324 spaces, each with a unique color/icon combination. Players guess a coordinate on the board, narrowing down what their opponent’s secret color/icon combo. Istanbul is a bitter of sleeper hit with me and the group. I find Rudiger Dorn’s design to be interesting but not compelling. When Dr. Steve brought Istanbul over, I was glad I could play it without buying it. It turns out Istanbul is a pretty good game. I think Dorn has found his stride with Istanbul. Dorn lifts elements from his Traders of Genoa game along with his Jambo game. Istanbul scales well with 2 to 4 players. I doubt I would play with 5 because of downtime. Istanbul is a solid 45 minute Euro. When I heard there was an expansion for Istanbul, I was suspicious. Why would they expand Istanbul other than a mad money grab? The game certainly doesn’t need it. While perusing the shelves at Out of the Box, Mel recommended it to me. He said it was similar to the expansion to Kingsburg. This is a ringing endorsement. I picked it up that day. Nick Sima likes Istanbul so I volunteered him to read the rules. I think we’ll be playing it next Thursday. This goes without saying: I cannot go more than a few days without buying a game. Now I don’t have a problem. I can stop anytime. But I thought I might shed some light on my recent game pick ups. I’m a sucker for Formula D. I’m also a completest. This means Asmodee will be milking me for the foreseeable future. The new map has Austin, TX on one side and Nevada on the other. The Nevada side has a jump across the Colorado river. Cool! Now if I can only talk Dusty and the gang into playing this game. Boss Monster caught my eye because of the theme. You play the boss monster, building your 8-bit world in an effort to defeat the heroes. I saw an expansion/stand-alone game called Boss Monster II. The game must be more popular than I thought if it’s already spawned an expansion. I haven’t played it yet but I’ve read the rules. The game should fill a niche in my collection as a “cool down” game at the end of the night. Ultimate Warriorz was an impulse purchase at Out of the Box Games’ grand opening. I loved the components. Standees fighting in an arena: love it! The game shares many things in common with King of Tokyo, a game I quite enjoy. I hope this game is a good alternative to it. I try to like Klaus Teuber games. Honest I do. Teuber is most famous for all the Catan games. But he is a prolific game designer above and beyond just the Catan franchise. I really like Entdecker (a game I haven’t played in years). Many of his games seem like they will be good when you read the rules. Then when you play the game they fall just a bit short. I love the cardboard bits in North Wind. You hire a crew, outfit your ship with cannons and sail to glory. One thing I can say about all of Teuber’s games: they really try to give you a sense of adventure. I hope North Wind delivers! The latest trend in board games is “____: the dice game”. Nations: The dice game is one iteration of this trend. Nations is a heavy Euro civ builder. It did not go over well in our group. The game is the spiritually hollow successor to Through the Ages. But Nations: the Dice Game, now this game might go over well with the Muskegon Area Gamers. The game could be a good warm up. It won’t be the main course but could whet your appetite for the epic games to follow. I’m a product of the 80’s. Good games from the that period are hard to come by. Most have not stood the test of time in our modern era of board gaming renaissance. But Milton Bradley’s Thunder Road is definitely an exception to this. Rated over 6.5 on boardgamegeek (compared to Monopoly’s 4.45), Thunder Road will hit the table when we get the nostalgia itch. Thunder Road is MB’s answer to Mad Max. Players race down a desert road in a dystopian world. There are armored vehicles, helicopters and speedsters. Players have a team of cars and helicopters and use them to win the race or destroy their opponents. I made a horrendous mistake. I bought Homeland: the Board Game. I compounded the error by making Bruce and Jon play it. Boy was that game bad. It’s so bad that I will never watch the TV show upon which the game is based. But I salvaged the situation a bit. I traded it for Island Fortress. This game has to be better than Homeland, right? I don’t know anything about this game. I just found someone desperate for Homeland. 8. Do you want to play any of these games? I blogged a few months ago about pirate themed board games. Merchants & Marauders got some treatment there. I liked the game for what it was and that is an adventure game with a little bit of strategy. 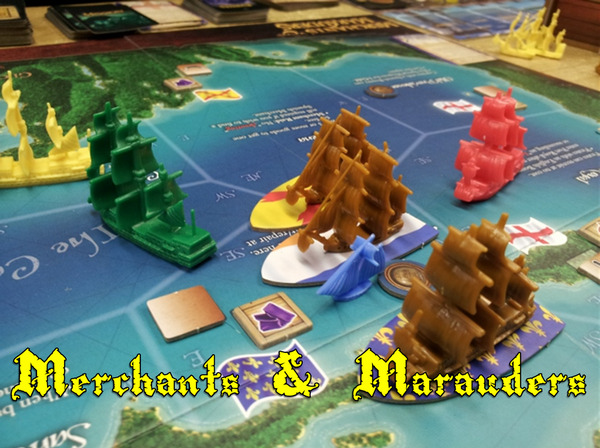 The expansion for Merchants & Marauders came out recently. I bought a copy. We managed to get this to the table last week. Here are my early impressions. Merchants & Marauders: Seas of Glory is a good value. You can pick up a copy for around $25 or so. And you get tons of stuff. There are additional cards, effectively doubling the size of three of the decks. There is additional plastic: new ships for every player and NPC. There are three additional player boards for all four players. The art work* and quality of the components is quite good. Overall, I am very impressed with what the components. The rules for the expansion add 11 modules and several optional rules. The first four modules are simply “more” of the base game. The size of the captain, rumor and mission decks have doubled. There are additional events cards too. *Seen here is one of the new captain cards. Z-Man games photoshopped some of the playtesters’ picture onto a pirate costume. It looks like pirate cosplay to me. I am not a fan. The game adds several new special weapons and ship mods. So “more” of the base game. The ship mods are a really good addition. They fix some things I had a problem with in the base game. It seemed in the base game that your captain’s skills and your ship’s stats were not related in a meaningful way with ship mods. Now there is a lot more interface between the two. The crow’s nest adds to your captain’s scouting ability; the carved hull lowers your opponent’s seamanship when fleeing. This is a nice addition! NPC ships now can have ship mods and weapons. This is an okay addition. It doesn’t add much but it doesn’t hurt either. New plastic has been added. Everyone has an additional ship type: the brig. The brig has good maneuverability (3). This means it can do merchant raids fairly well. The brig also has good cargo (4). So the brig can also do its fair share of being a merchant. The brig only costs 20 gold making it 15 gold cheaper than the frigate or galleon. The brig does not grant a glory point, however. This makes the brig a good ship but not an obvious choice. If you need to upgrade your flute or sloop and you can’t quite muster enough cash for the frigate or galleon, the brig might be the right choice. The Spanish Treasure Galleon sails around the Caribbean, collecting gold. This acts as a lightning rod, attracting the most intrepid captains to take her down. The maneuverability of galleons has been reduced from 2 to 1. This was a necessary errata to keep the decision making about which ship to buy tense. The expansion fixed one of my problems with the base game in a round about way. There were 35 cards in the event deck; about 7 were storms. This meant you were going to get hammered by storms regularly but also randomly. The expansion added 15 cards to the event deck–none have storms. This dilutes the storms to a much more manageable situation. And to offset this, there is a permanent storm on the board. This is much more predictable than the random events. Players spin the wind at the beginning of the turn and move the storm accordingly. The wind direction also helps or hinders the players. Players moving with the wind get one extra action; players moving against the wind get one fewer actions. The coolest addition to the expansion is the new locations. While at a sea space, you will have the opportunity to visit a location. It costs an action. And each location does something different. Or, you may raid the location and permanently remove it from the game. This adds a lot more strategy and tactics to the game–something the base game really needed. There was way too much luck in the base game. As much as I like adventure games, I really need there to be some strategy in my longish games. The last module is f0rces players to manage the loyalty of their ships. Since you can only move up one space per port action, players will not be able to outright buy “Fiercely loyal” crewmen. And if you start and end your turn in the same port, you will lost one loyalty. This prevents turtling. I think Seas of Glory is an exceptional expansion. It has all the things in it that make an expansion good. It patches a few things that annoyed me with the base game. It adds replayability and strategy. It adds lots of components at a good value. 8. Interested in playing this with us? I think an additional column regarding new games our group has acquired would be a welcome monthly read. Here is our first official installment. If anyone else in the group has anything to add, please comment below. This will keep everyone abreast of the the Muskegon Area Gamers’ growing gaming library. In 1982 Milton Bradley released the first of its highly successful Gamemaster Series games: Broadsides & Boarding Parties. And I wanted it ever since. Now I own a complete albeit used copy for $70 plus shipping. Out of the Box Games had their grand opening in Kentwood last week. Of course I had to attend. And I picked up the Amberden Affair. This game may be a nice fit for our group. Some social intrigue and deduction, a hidden traitor, multiple paths to victory and short game length are all positives. Looking forward to bringing this out sometime in December on a Tuesday. The first time I heard the term “blockade runner” it was in relation to the Millennium Falcon. I fell in the love with that term immediately, needless to say. When I saw there was a game bearing that name that dealt with piracy in the Confederacy, the theme along with the title grabbed my attention. I shipped out Sherwood Forest for this game in trade. Mage Wars is like Magic: the Gathering in theme but without the constant need to buy new cards. Players take on the roles of powerful spell casters. There is customizable spell books plus lots of expansions. The game is very good. I picked up the entire Mage Wars collection in trade, giving up several DOW games. I was more generous in this trade than I normally would be but Mage Wars is a good fit for the Gaming Annex. I picked up Gentlemen Thieves at OotB grand opening. Like the Amberden Affair, this game has a niche that our group might really like. Also, Asmodee Games makes really good components so I know there is a lot of quality in the game. This and Amberden Affair should be hitting the Tuesday night meetups in December. Check local listings. Crash Games’ Paradise Fallen was an impulse buy at the grand opening sale for Out of the Box. I’ll let you know if it makes the grade. Eight Minute Empires was received lukewarmly from our group. Tiny Epic Kingdoms might be the game that fills the :30 minute civ builder game. It is infinitely expandable too which will help with replayability. The game that fired King of Tokyo: King of New York was a must buy. And must buy it I did. The Gaming Annex now has a copy of this fantastic game. Come on out and play it with us!